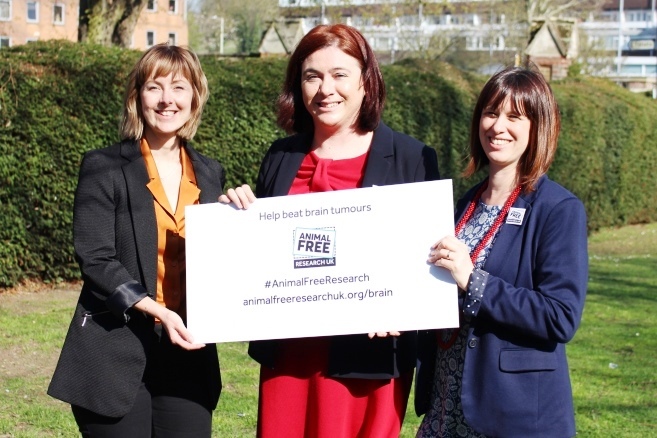 East of England MEP, Alex Mayer, is backing our bid to raise £50,000 to help beat brain tumours without animal suffering. With your help, we’re funding Professor Geoff Pilkington’s ground-breaking brain tumour research at the University of Portsmouth. Brain tumours are particularly difficult to treat as the brain is protected by the blood-brain barrier which importantly prevents toxins from getting into the brain. Professor Pilkington’s all-human model – the first of its kind – allows his team to investigate how to pass drugs through this barrier to successfully treat brain tumours. Thanks to the generous support of compassionate people like you, we’ve already raised over £100,000 to fund this research. But we urgently need to raise a further £50,000 so that Professor Pilkington can continue his pioneering research. Just £25 could buy a fluorescent dye kit to track drug delivery across the team’s unique all-human blood-brain barrier model – helping to find more effective treatments for children and adults with brain tumours and to save countless animals’ lives. If you are a UK taxpayer, the value of your gift can be increased by 25% under the Gift Aid scheme at no extra cost to you. This means a donation of £10.00 could be worth an extra £2.50 to us, and it doesn’t cost you a penny. I want to Gift Aid this donation, any donations I make in the future or any donations I have made in the past four years to Animal Free Research UK. I am a UK taxpayer and understand that if I pay less Income Tax and/or Capital Gains Tax than the amount of Gift Aid claimed on all of my donations in that tax year it is my responsibility to pay any difference. Animal Free Research UK will claim 25p on every £1 donated. You can change your mind at any time by clicking the unsubscribe link in the footer of any email you receive from us, or by contacting us at info@animalfreeresearchuk.org>. We promise to keep your data safe and treat your information with respect. For more information about our privacy policies please visit www.animalfreeresearchuk.org/privacy-policy.